One night earlier this week the wind was lashing raindrops hard against my window, in a way it hasn’t since last winter. Lightning and thunder are a rarity on this part of Vancouver Island, as the ocean moderates our air temperature, but now the rain was hammering down in an insistent drumbeat and reminding me of proper prairie storms. I had to tighten up the window latch. And the noise had me thinking about Usnea, old man’s beard, the medicinal lichen. “This is a good Usnea storm,” is what I was thinking, specifically. Because lichen has a slow growth rate, we’re taught to avoid harvesting it directly from the tree – better to wait until after a good gale when you’re likelier to find it on the ground. I reflected on our day with Andy MacKinnon last winter, a mushroom walk that turned into a lichen talk, and how he told us to wait until early fall for prime mushroom season, when the conditions were better for spore disbursal. Now it was upon us. 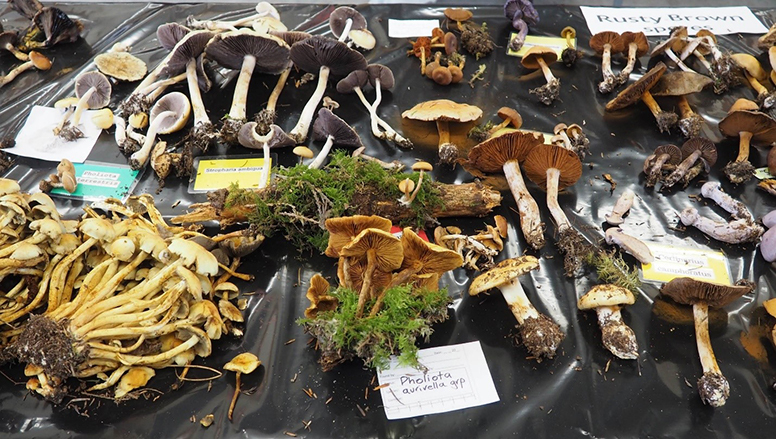 A sample of the specimens on display at the SVIMS Mushroom Show. The larger mushrooms in the upper left are Stropharia ambigua, a native species which are edible but said to taste like old leaves. 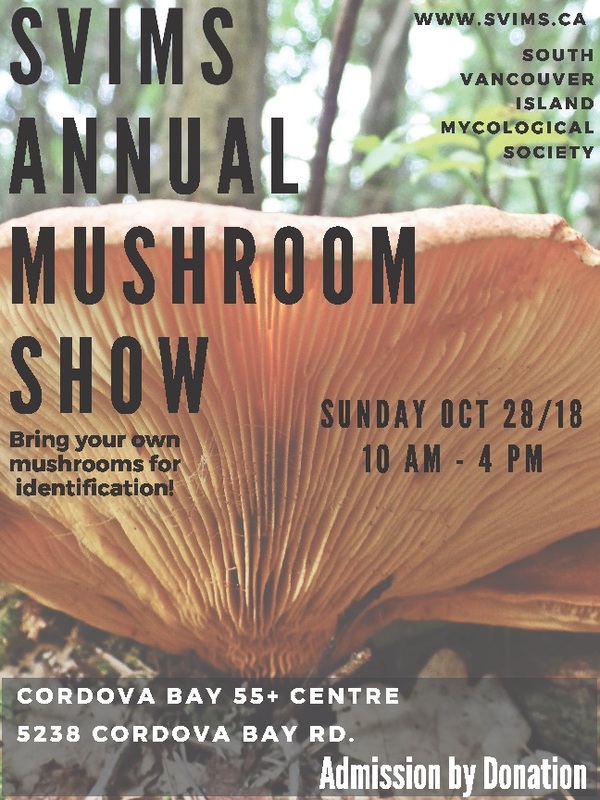 Fittingly, it was a few days afterwards that I found myself somewhat unexpectedly at the annual mushroom show put on by the South Vancouver Island Mycological Society, of which Andy is the president. And I was in good company: pen in hand, I was tagging along behind Robert Rogers. Robert is a professor in the Department of Family Medicine at the University of Alberta and an instructor at the Earth Spirit Medicine Program at Northern Star College in Edmonton. He’s also a long-time herbalist, a prodigious author (with an oeuvre that includes The Fungal Pharmacy: The Complete Guide to Medicinal Mushrooms and Lichens of North America), and is typically found bedecked in mushroom garb – though for this visit his signature mushroom hat was left at home thanks to the vagaries of airport security. 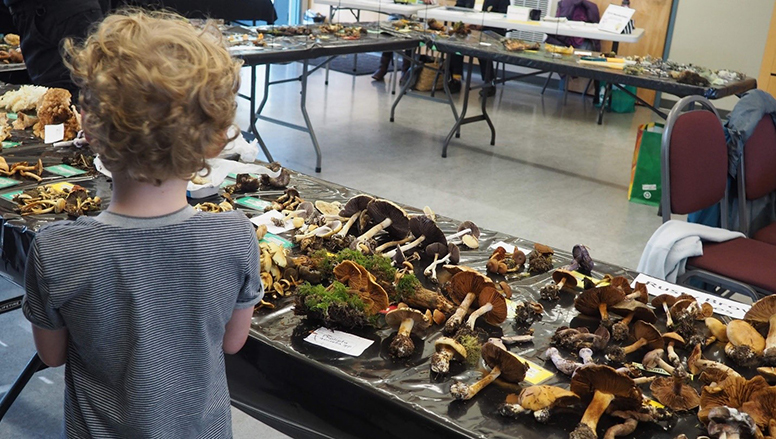 Robert was in town to teach a weekend workshop called Medicinal Mushrooms of Western Canada, and after a morning spent IDing specimens with the class at ȽÁU,WELṈEW̱ (Mount Newton), he’d rerouted us to Cordova Bay for the mushroom show. Here a steady stream of attendees was moving through the room, thronging around the mushroom-laden tables, peering and smelling and muttering gravely in the manner of a gang of oenophiles. After a while I figured out that you could separate the mycologists and experienced hobbyists from the casuals by how they handled the specimens (the pros: like a scuffed up baseball, and me: like a delicate vase). Holding a Suillus lakei, or Lake’s bolete, an edible ectomycorrhizal fungus native to Western Canada which grows only under Douglas-fir trees. The Scottish polymath Thomas Carlyle said “Nature alone is antique, and the oldest art a mushroom,” and in here, amongst the ochres and corals and the lithe gills and jaunty pilei, it had the ring of truth to it. Personalities abounded on the tables, alive with their mycorrhizal quirks. In one corner was a display dedicated to medicinal mushrooms, and I ambled over that way. On one side was a wriggly-looking bunch of Cordyceps militaris, or caterpillar fungus. Robert had talked about this at length during his lecture the day before, and so I leaned in for a better look. The better-known caterpillar fungus, Ophiocordyceps sinensis, grows at altitude in the Himalayas, where it is harvested by hand and accounts for a significant part of the Tibetan GDP. Called dong chong xia cao, or “winter worm, summer grass” in Chinese, this cordyceps is entomopathogenic, or insect-killing – its mycelium colonize the host insect and then multiply until they eventually overtake its body. Specimens of Amanita phalloides, the death cap mushroom. Death caps, which originated in Europe, were first sighted in British Columbia in 1997, likely having made their way to the province on the roots of imported ornamental trees. They are responsible for the highest number of fatal mushroom poisonings in the world. 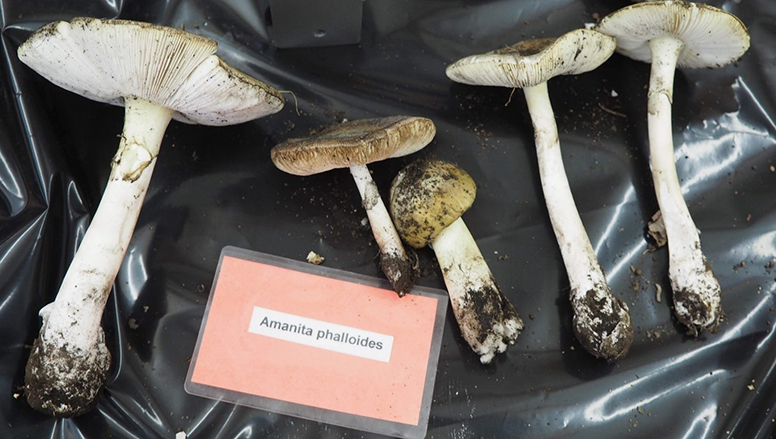 Amanita phalloides has been mistaken for edible mushrooms including the Asian paddy straw, and puffballs; the British Columbia Centre for Disease Control has published a warning pamphlet to assist with identification. Long used in Asia as a general tonic, particularly as an energy tonic, Ophiocordyceps sinensis gained wider exposure after a Chinese runner named Wang Junxia knocked 42 seconds off the then- world record time in the women’s 10 000 meter race in 1993, in an apparently cordyceps-powered run. Some time later a kilogram of cordyceps sold at auction in Hong Kong for $60 000 USD. But in recent years global warming and overharvesting have conspired to reduce supply, and Cordyceps militaris, which grows on the Sunshine Coast and is more amenable to cultivation, has emerged as an intriguing alternative. Elsewhere on the table was a shiny, port wine-coloured slab of Ganoderma applanatum, the artist’s conk. 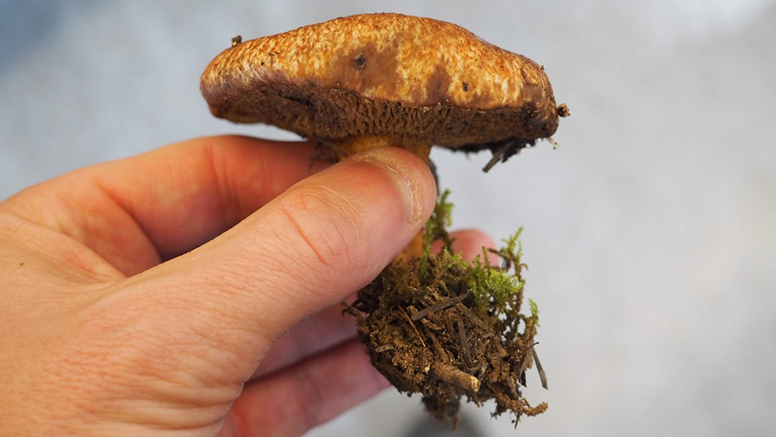 This mushroom grows in British Columbia, as well as on balsam poplars in Robert’s home province of Alberta, and he had shown us a picture of himself hoisting a twenty-two pound, sixty year-old behemoth in class the day before. Like its famous cousin Ganoderma lucidum, or reishi, the artist’s conk has been shown in clinical trials to possess potent anti-tumour, anti-inflammatory, antibacterial and anti-fibrotic properties. Robert emphasized that sustainable harvesting is crucial: as a long-lived perennial species, Ganoderma applanatum can persist for many years if the harvester trims only the medicine-rich outer rings rather than removing the entire fungus. 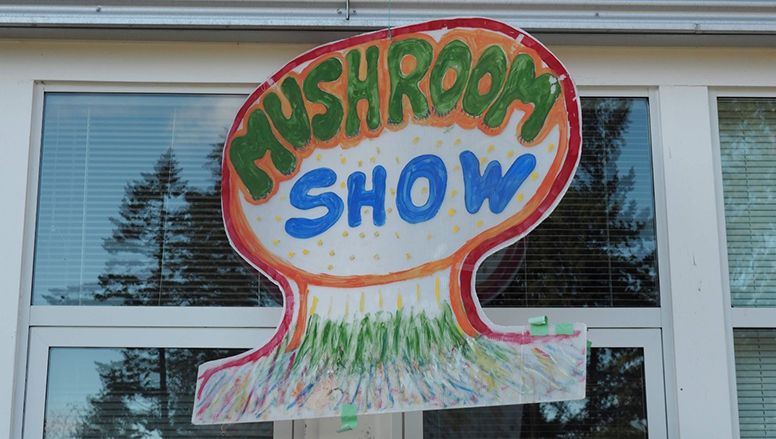 Seen at the entrance to the South Vancouver Island Mycological Society’s Annual Mushroom Show, held in Cordova Bay, Saanich. A few specimens of Pleurotus populinus, the pearl oyster mushroom, sat unobtrusively near the conk. When a container ship slammed into the Bay Bridge in 2007, spilling 58 000 gallons of oil into San Franciso Bay, Paul Stamets swooped in with native oyster mushrooms which he used to break down the oil so that it could be composted. Other mycoremediation research efforts have yielded a species of mushroom that can digest polyurethane waste; a few years ago the permaculturists at Linnaea Farm on neighbouring Cortes Island employed inoculated wood chips to filter their creek water and combat algae blooms in a nearby lake. Examining the “rusty brown spores” section of the tables at the mushroom show. Seen in the foreground is the Pholiota aurivella group, which are native to the Pacific Northwest and are characterized by yellow to orange viscid caps with large, dark scales. 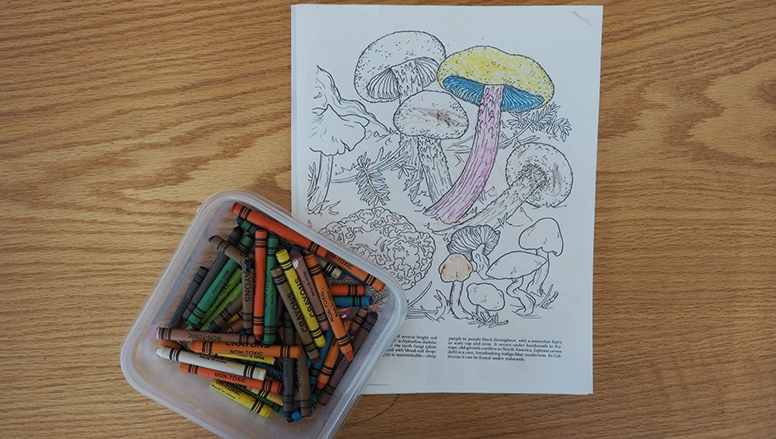 Though they weren’t present at the show – owing to existing legal restrictions on its cultivation or possession of dried material in Canada – the Psilocybe mushroom species has also gained substantial scientific interest in recent years. Clinical trials show promise for the mushrooms in treatment of anxiety, treatment-resistant depression, substance addiction, post-traumatic stress disorder, and obsessive compulsive disorder. Arriving back into my head at the mushroom show, I stretched, a bit overwhelmed by the torrent of Latin names and new information – and then, in good company amongst Carlyle’s “oldest art”, I started on another loop of the tables. Young mycologists at work on a partially-completed art piece at the SVIMS Mushroom Show. Seen on the left, not yet coloured, is a rare Leptonia carnea, an indigo-blue mushroom native to the Pacific Northwest.